Kevin Patterson sports an impressive CV. This noted novelist, whose previous works have received worldwide acclaim, is also a practicing doctor who lives and works in Salisbury Island and Nanaimo, and several times a year, heads up to the Arctic, to help folks on a terrain that is rough and sparse. 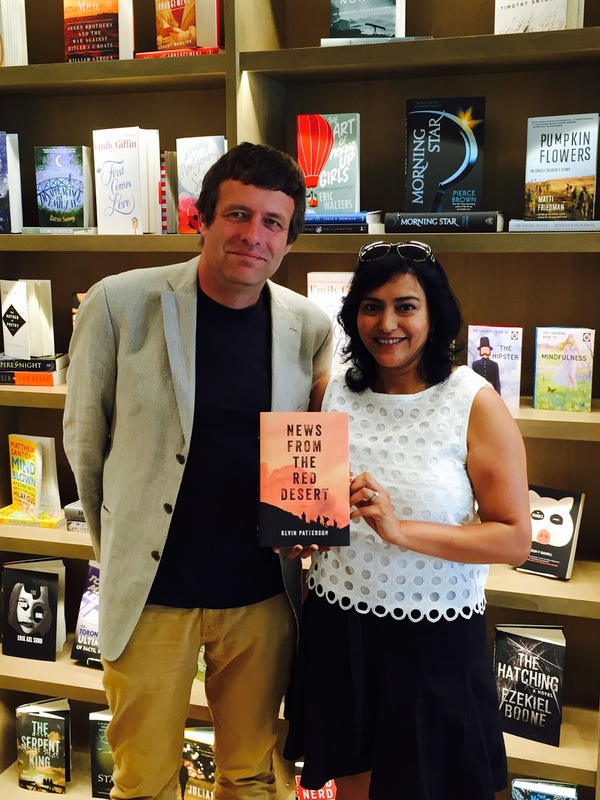 His latest literary feat, News From The Red Desert, by Penguin Random House Canada, is about the war in Afghanistan. It’s a comment between the distance of stories we tell ourselves and the reality of war. Kevin Patterson suggests that the stories we usually tell ourselves are like American Sniper and Zero Dark Thirty; they are about justice and purpose, controlled discipline and surgical strikes and smart weapons with a clear demarcation between good and bad, right and wrong. 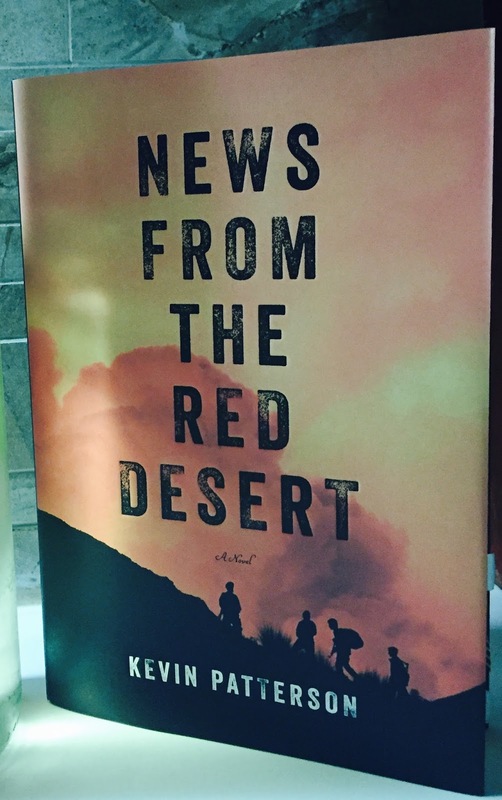 News from the Red Desert is an attempt to show reality with the ensuing chaos and moral disarray that occurs. It’s an opportunity to narrow the gap between the two narratives and humanize the effects of war. The characters are beautifully portrayed and remarkably relatable. Each has a voice that helps us get into their psyche. Kevin Patterson’s has a knack of taking you right to the scene of a crime and helping you to experience the narrative through the eyes of several characters. There is a main protagonist though in News From The Red Desert, a journalist named Deidre. She has one job – to cover the war. But as the story progresses, you see Deidre starting to rethink her position about what she believes to be the truth. Journalism can be tricky sometimes. Kevin Patterson is as charming and eloquent as I had imagined him to be after I read News From The Red Desert. 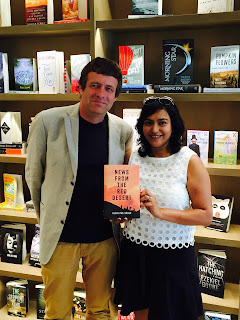 In my sit down with Kevin, I got to learn a bit more from this brilliant author, and get a sense of how the book came about, and what he hopes the reader will appreciate from this literary snapshot of our current political world at large. ME: Do you come from an army background? ME: How did you enlist? ME: What are the challenges working in the Arctic? KP: Biggest deal is the lack of resources. There’s no hospital really. There’s one in the Iqaluit but I work in the west coast of Hudson Bay and there’s a tiny 10-bed hospital in Rankin. But really, the nearest hospital with surgery and anesthesia and CT scanners is many hundreds of miles away. Wherever you are up there, so when people come in with strokes and heart attacks and dogs mauling and things, it’s hard to take care of them because the tools you are used to are not readily available. ME: The book is absolutely wonderful. As you journey through the end it rattles you. But it’s good, because it puts you in a place that’s real and you start thinking of different things. But because the book is so current it’s hard to dissociate yourself with what’s happening with the world right now, and you’re watching the news or reading the paper. KP: Everything there has happened already. The green on blue shootings and those torture scenes are right out of the center that works with torture. It’s all happened. Those generals are pretty much real. ME: So how do you disassociate yourself from reliving that as you were writing the book? KP: Oh, that’s exactly what you go after; when it’s going well I’m watching a movie in my head and I’m listening to people talk to one another and I’m just transcribing it. It feels like I don’t even steer the events very much, they just sort of happen. That’s when it’s going well. It doesn’t always go well and some days there’s a lot of steering and forcing and prodding to try and get the words down. And the other point is that this book is a comment right. It’s a comment between the distance of stories we tell ourselves and what we allow ourselves about war and how we prosecute wars and the reality of war. The stories we tell ourselves are like the American sniper and Zero Dark Thirty and they are all about justice and purpose, controlled discipline and surgical strikes and smart weapons. And the reality of war is about chaos and moral disarray and people who don’t know who’s shooting at one another, who they are shooting at and they don’t even know anything about their opponents. Because in order to do what they do, they’ve had to dehumanize their opponents; and the distance between those two narratives is enormous. And it’s not just the dramatic writing or the films that hew to this fantasy of war, but it’s also the journalism. During the first three-quarters of the time we were in Afghanistan the journalism was terrible, it was like they were covering sports teams. Don Cherry was like “go go boys”. Oh, it was horrible. They ascribed purpose and the reporters covered it as if they were part of the mission. And the embeds in particular were deeply, deeply concerned with the thousands of people we killed…you know…thousands of people died with Canadian bullets in them…that did not register. And it was just at the tail end of our mission there when things weren’t going as well, when none of the things that we had said we were there to achieve, had been achieved, that there started to emerge some skepticism. And that’s the moment that I actually want people to think about a little bit. because there will be another crisis, another event where we are all thinking about going into a war and it might be necessary. I think there are certain circumstances when intervention could be conceivable work. I can’t but think that Rwanda might have turned out better if the west had gone in there. a million people were killed in twelve weeks. Could we not have made that less catastrophic? Maybe we could have, I don’t know. But we need to not tell ourselves a bunch of fantasies about affecting cultural change at gunpoint. That doesn’t work. ME: I thought you did a really good job with that stuff and I loved the vignettes you used and each one was so brilliantly captured, what they were thinking, how they were feeling, how they saw the other side, themselves. Was that something you consciously did? KP: This whole book is a reaction against the media coverage about that war, which was non empathetic. It was always about tactics, the situation on the ground and the circumstances, weaponry and ra ra ra. But nobody went into the heads of anybody in an effort to understand what does it feel like to be participating in this? What does it feel like to be shot at by this potentially lethal machine? And novelists get to do that. That’s why the last and most important comment on the war is achieved. KP: Novels have ability to go into different people’s heads and have people have empathy (or not) for one another. 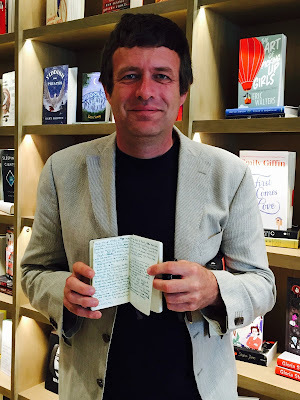 These are the techniques that are available to novelists to…. and not available to the journalists. ME: You look at war from very unsettling practices. The book itself, how did it come about? You co-edited another book of stories, “Outside The Wire: The War in Afghanistan in the Words of its Participants” which was published in 2008. Where did the kernel of the idea for News From The Red Desert come from? KP: After 2007 I spent a number of years trying to write a book about my twin brother and another big trip I made across the Pacific Ocean and it never really gelled or worked for some reason. It’s a little bit mysterious to me and then finally after years of working on that project I just put it aside and I was wondering what my next project would be and I just started remembering sitting in that café in Green Beans watching the waiters and baristas. I just remember watching them and wondering what this whole enterprise looked like from their eyes and they would have been aware of hundreds of thousands of dollars being spent and I wondered how profligate this seems to them and how purposeful it seems and I tried but it was difficult to engage them in conversation. They weren’t much interested in speaking to foreigners. So I remember wondering that and something there and that was the starting point of the novel.Then I just went into their heads and did that story. KP: Well, this is the arrow in the novelists quiver that nobody has, right? The emphatic leap to look into other people’s heads and see the world through their eyes and that’s a great gift; that’s why novels are not going to go away. ME: So, what was the writing process like? KP: So with most of my books, there’s this flurry of optimism and delight and this is going to be the best thing I ever write and it’s such a good idea and I say that’s great. And I start working, and I’m pleased with myself for a while. And then it’s not quite as good as I thought it was going to be. Yeah, that’s the process, and that’s fine. And by the time I’m signing off on the last revisions and wish I could just pull it. And I think it’s terrible and I’m just so sick of it and the jokes are so lame and everyone is going to know what’s going to happen. But you have no idea right. Because you’ve read it too many times at that point. ME: I write short stories, but a novel writing is a different beast. Was it easy to make the transition from short stories to a novel? KP: So my book Country Of Cold are links for short stories and for me that was the transformation. Because we thought of novels as far described as being so much more involved. So, I wrote a book of short stories and for me it was just the characters recurred in different short stories and I would use as a major character at one time could be a minor character in another. For me this was the leap from short story to novel. And then it was easy to stop calling them short stories and just call them chapters. So in my chapters I try to have a narrative arc that makes it self-contained as a short story. The reader wants it …wants a chapter to have a sense of its own trajectory and when it’s well written, it will have that [inaudible] that small trajectories within larger trajectories. ME: Are you a survivor fan? KP: I like writing about people on the edges of the world. The Arctic is like that; I think people reveal themselves in their conditions and Afghanistan was a bit like that too. So there are a lot of pressures and conflicts and decisions that have to play themselves out in my head. ME: Where did the title of the book come from? KP: There’s this great book called News From Tantary from Peter Flemming, who’s the brother of Ian Flemming (Bond Books), and it’s one of the great travel books of all times and then Lily Tuck wrote a great novel 15 years ago called News From Paraguya, which I admired and so it’s a conscious rip off from both authors and then I was conscious of the fact that I wasn’t really writing a novel about the war but writing a story about the stories we tell ourselves about the war. And I wanted the main character to be a journalist, not a soldier. ME: Did it come after the fact? ME: How do you write? KP: It starts off as a fountain pen and little notebook. The initial outline gets a lot more detailed, to the point that each chapter is mapped out and what happens in each chapter will be defined and will fill out a couple of these books. And then I start typing on a computer and in that I don’t always stick very closely to the outline that I’d already prepared. There’s a lot that happens; a whole plot can change; characters will be discarded; as the story dictates. And then I type it out and typically be working on a chapter; and as I see downstream repercussions of things I see in that chapter, I’ll skip ahead of chapters. And at some point I may get an idea. I find endings really difficult but when I get a sense of the ending I might leap way ahead and then write out the essence of the ending. Elmore Leonard always said that he’d write the beginning and the end and then connect the two. And that’s not bad advice. But I don’t want that too early on. I don’t want things to be dictated linearly. I find life kind of messy and confusing and full of blind alleys and so I don’t want the reader having a sense that she’s gotten on a train and she’s arrived at the station. ME: Have you been tempted to write books that are a bit more orthodox? KP: No, the great thing about my situation is that I have a living practicing medicine. I write books so I can belong to the community of writers, and it’s makes me so happy. I feel like that that is my religion that these people see the world the same way I like to do. And I feel that if I stopped writing, I’d stop belonging. ME: Do you read when you are writing? KP: I have to be careful about what I read when I’m writing. What appeals to me are not highly conventional novels but which have a narrative thrust; characters and identifiable storylines. 2. Louis de Bernières book The Dust That Falls From The Heavens. Louis de Bernières is a British novelist most famous for his fourth novel, Captain Corelli's Mandolin. KP: When I’m writing fiction I tend to read mostly non-fiction and it’s often in an attempt to research what I’m writing about so I have a sense of similitude about the subject. KP: Well sailing is great. When you go sailing you get a few miles off shore and your cell phone just stops. It was inspiration for his first book The Water In Between: A Journey At Sea is a cautionary, but inspiring tale for anyone who has wanted to escape into another life. It’s a travel memoir of his expedition in the Pacific Ocean. The book was nominated for 2000 Edna Staebler Award for Creative Non-Fiction. ME: What was it like growing up in your family? KP: When I was young I thought I wanted to be a mechanic. It wasn’t much later in the game that I realized I didn’t want to be a mechanic. So I copied him. [Kevin's twin brother wanted to go into medicine] It’s what twins do, when they don’t know what else to do. So I got into medicine. And even before I was in medicine, I joined the reserves. I was an infantry officer and not a very good one. (laughs). And when I got into medicine I thought it would be adventuresome to do that in the military and I signed up for this deal where they paid for your tuition and afterwards you worked for them for 3 years. So I did that. And instead of going off to foreign climates and exotic locales, I went to Shilo Manitoba in South Western Manitoba – really quiet and desolate and I had this battalion of 450 men to take care of and none of them had anything wrong with them and so I was really under stimulated for a couple of years and in that quietness I started writing short stories in an effort to occupy myself and after a while they started selling. And after I got out of the army I went travelling and sailed across the Pacific Ocean and when I got back I did an MFA postgrad at UBC. And to finish my MFA I had to write a dissertation and so I wrote a book that became The Water In Between. ME: Where do you like going when you are in Toronto? It seems like I’ve known these friends for 30 years, but there’s just an intense warmth and delight. ME: Do they visit you? KP: No (lengthy noooo). Torontonians don’t visit, they just stay here in their cool city and expect people to come to them. KP: Yeah, why would they leave this place? With our lovely cafes and bars and bicycles. ME: Was there a particular incident you remember that didn’t make it into the book? KP: Oh, not really. There’s’ not really any things that happened in Afghanistan that come into the book. It was more the mood and the circumstances and the big picture. I should emphasize that when I was there I didn’t leave the base. I’ve become skeptical about the utility of trying to perform anything but the most MSF sort of patch ‘em up and save lives kind of view. The idea of doing aid in a conflict situation makes no sense. A trillion dollars was spent in Afghanistan. Canada only spent $25M and you could end child hunger on the planner with $75 Billion. So that’s trillion/ trillion and a hlf that was spent in Afghanistan, and that’s a lot of $75 Billion. Because it was a million dollars per man per year to have a soldier in Afghanistan. You know? It’s insanity. What that could have done in African countries for peace. It could have been completely transformed. Take a hundred billion dollars and put it in girls’ universities in Africa and see that place change. And that would be 1/15th of what was spent there. never mind what was spent in Iraq. ME: Are you already working on your next project? KP: Yes. It’s a novel. It’s set in TO between about 1980 and today. It’s about cultural change. It sounds really boring, I know. News From The Red Desert is published by Penguin Random House Canada.